Is it a gastro pub, is it a drink after work pub or a tourist pub? Well it turns out to be all three and it does it badly. Wood and chunky clunky tables everywhere, it gets packed and the bar staff [apart from one] are rude and so unwelcoming. This is place has an atmosphere but then you get annoyed because it takes forever to get served and when you do you are greeted with miserable faces and attitude. It can be such a good pub if it knew what it was as a pub. I have had a few good nights in there but overall I do not recommend it to anyone as it is also expensive as well. so the pub must be doing something right. Czech dark lager ( I think it was from the Bernard brewery. £4-10 a pint. There seems to be a mix of students, tourists, and during the week office staff. Like this pub. Especially as they Black Sheep on. 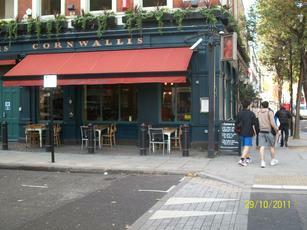 The Lord John Russell, Russell Square ought to bring their bar man here to be shown how to behave towards customers. And perhaps know the difference between red and white Rioja wine, and gain a further basic knowledge of products they sell. This place is well run, clean and staff are exemplary in attitude and knowledge of the wines that they offer. Top marks. Our new local after last nights incident at the aforementioned pub. A great burger and fries and a nice pint of Yorkshire ale went down well on a Friday afternoon while a curiosity of this pub is the range of American ales on tap. It was once part of the egregious Goose chain so it's a massive improvement and at least has some singularity when viewed in relation to the chains of the Brunswick Centre. A good option for a post film pint after a trip to the Renoir cinema.